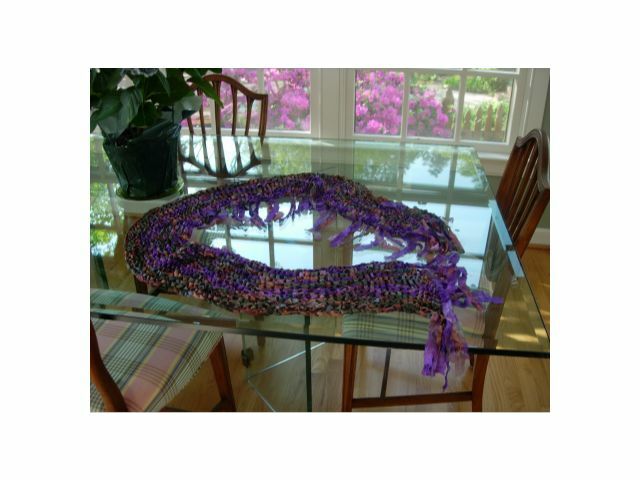 Wishing your favorite piece of knitting was featured on Sandrasingh.com's Customers Creation page? Well, you can be in the spotlight! It's as easy as emailing, send a clear digital photo of your finished project along with a description, the yarn or pattern you purchased on my site and any other details, to Sandrasingh@sandrasingh.com. And your project will be featured and you’ll receive a Coupon good towards $5 off your next order. Vicki from San Antonio, TX sent me this photograph of her lovely shawl..."Sandra, the picture's not great but this is Goddess Knits' Chinese Lantern Pattern that I made in Lorna's Laces Shepherd Sport in Chagrin. It made up beautifully and fast. 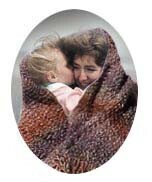 It went to one of our Prayer Shawl Ministry recipients." Vicki your shawl is exquisite and this is a very thoughtful gift that I'm sure if much loved by the recipient. Phyllis from Queen, NY sent me this photo of her lovely shrug that she knit in Malabrigo Silky Merino. Her story..."I finally finished the Easy Lace Shrug I’d mentioned in my introduction. This was knitted with Silky Merino in Cumparsita. And I bought it from you during March Madness." Phyllis thanks again for being a patron and for sharing your beautiful work with us. These wonderful Tangled Vine Socks, pattern by Chrissy Gardiner of Gardiner Yarn Works, were knit by Barbara of Huntsville, Alabama. Barbara shares her experience..."I made 3 pairs using Malabrigo Yarns' Sock, Green pair--color Lettuce, Black pair-- color Black and the Purple pair--Violeta Africana. Thank you for the pattern. 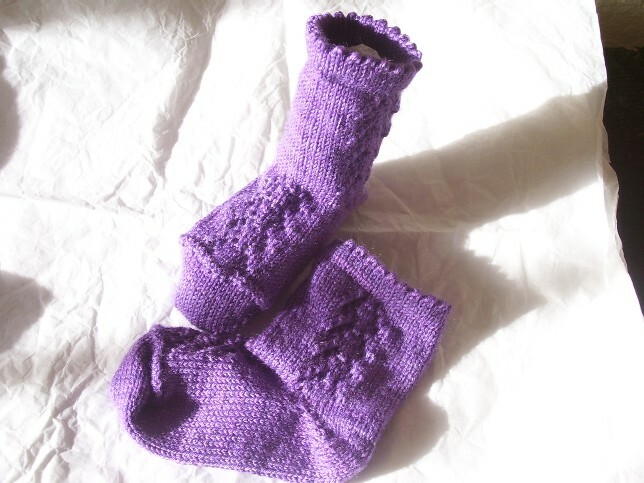 I really enjoy knitting it and plan on making more socks using the same pattern again." Barbara I look forward to seeing which color you knit them in next and "Thank you," for sharing your socks with us! Sara from Durham, NC knit the lovely Baby Fan Mitts from just one skein of Malabrigo Silky, in the Redwood Bark color. This is Sara's story..."I just thought you might be interested to know that I recently completed the most beautiful pair of fingerless mitts using a skein of Malabrigo Silky Merino that I ordered during your summer sale. I was so impressed with your personable and speedy service that I also made sure to give a shout out to you and your shop when I featured the mitts on my blog this morning. You can find the blog entry here: Wool Durham." Sara thank you so much for sharing your Baby Fan Mitts with us and for blogging about it too. Enjoy wearing them, I know you'll get lots of compliments. 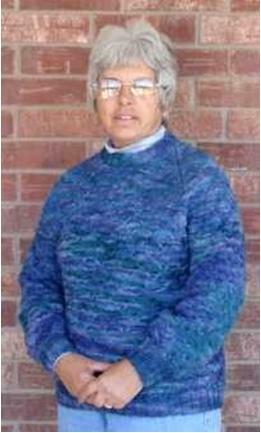 Wanda, from Berkeley, CA, enjoys knitting for her loved ones. She knit the very sweet Watermelon Sweater & Hat set by Kidknits for her adorable granddaughter. Wanda made a few modifications to the pattern and here she tells us what she did..."For the hat, I used the same yarn and size needles but increased the cast-on to 77. I also used an I-cord for the "stem." For the sweater, instead of casting-on 46 stitches per side, I did 58. I kept the motif the same size and I made the sleeves about 3 inches longer and decreased much more slowly. For ease, I did both sleeves at the same time. Rolling up the sleeves is a great option since I know from experience that kids grow out of the sleeve length pretty quick." Wanda from the picture we can see that your granddaughter loves her new outfit, its very cute and so is she. Thank you for taking the time to share the set with us and for letting me publish it. This beautiful blanket was knit by Julie from Claymont, Delaware. The pattern is Anne Hanson's Totally Autumn and Julie knit her blanket out of Malabrigo Merino Worsted in the Lettuce color. This is Julie's story..."I bought the yarn (from Sandrasingh.com) for a sweater but then decided against a Malabrigo sweater after knitting one in another color and learning how much it pills. I held on to the yarn for a while trying to find the perfect pattern and decided it needed to be a blanket. It's so soft it's insane." Julie your blanket is just lovely and will brighten up any room while keeping you nice and toasty warm. Thank you so much for sharing it with us. Wendy, from Seattle, WA, is an avid crocheter. 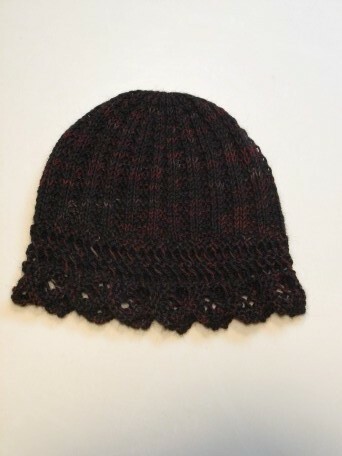 Her adorable tam is Knotsewcute's Classic Cables design and Wendy does a superb job with it. 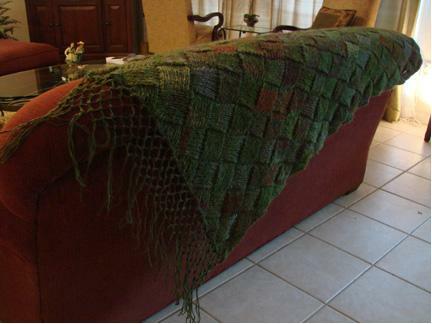 Here's her story..."This is a crochet cabled tam done in Berroco Comfort DK, color Lovage. The yarn is smooth and soft, no pilling whatsoever, making a nice beret that is both warm and breathable. Hat pattern is from Classic Cables Scarf Set by Kim Miller." Wendy enjoy wearing your new tam and thank you so much for sharing it with us. This stunning shawl was knit by Jessie from Edgewater, MD. Jessie shares the secrets of her masterpiece with us..."I think you can understand that my project queue is pretty long . 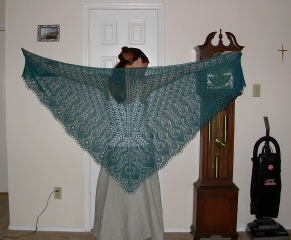 . . but here are some photos of the Goddess Knits' Midwinter's Eve Shawl. I put in beads for snowflakes, mountains (with ice caps), and holiday ornaments on all the pine trees. The yarn is Jaggerspun Maine Line 2/8; I think they call the color Bottle Green although I think it is a forest green. The beads are various; the mountains have 4 mm crystal cubes and 4 mm black iris cubes, the snowflakes have 8/0 clear crystal, the trees have 8/0 silver-lined colors, and the snow at the bottom is a bunch of 6/0 magatama crystal that I was trying to use up." Jessie thank you very much for sharing your lovely shawl with us. This beautiful and warm looking vest was knit by Deb, who is practically my neighbor, she's from Fredericksburg, TX. 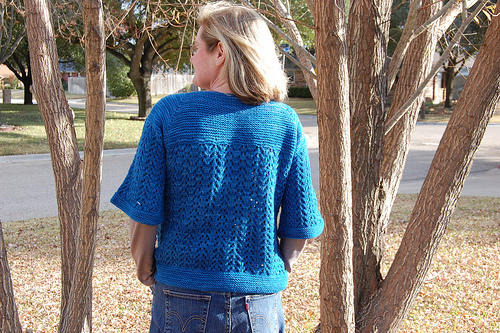 The pattern is Lisa Ellis Designs' Super Bulky Winter Vest and Deb knit it in Cascade Magnum. Deb shares this about her experience with the pattern and yarn..."I bought enough yarn to make four of these vests! One for each of my daughters. The yarn was a dream to work with....just luscious and frankly, a sensuous experience! So soft and lovely and yet, not too heavy. I don't have much experience with knitting....but if all yarns feel this good, I could get addicted! Your service was 5 Star too!" Thank you Deb for your kind words and for letting us see your beautiful work. This bright and lovely cardigan, designed by Rebecca Hatcher for the Schaefer Yarn Co, was knit by Ginny of Berkshire, NY and I know with all the snow she's been getting up there she's getting a lot of wear out of it! 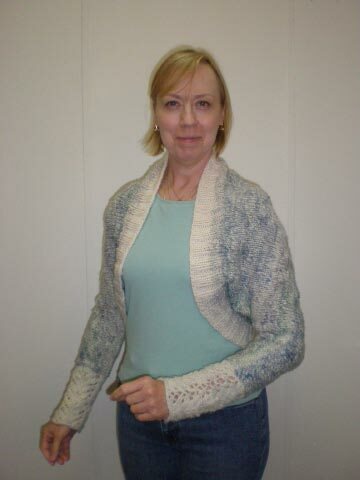 Ginny tells us this about her project..."Here is my Shawl Collared cardigan, made from the Schaefer Pattern by the same name. I did indeed use Esperanza (in the colorway Clara Barton). This was a SUPER fast and easy pattern. I made one modification: didn't like the buttonholes so I used a row of single crochet with the button loops worked in. I made an XL and used 4 skeins of Esperanza with only the smallest amount of yarn left over." Ginny your cardigan is really sophisticated and looks very warm and cozy, I appreciate the time you took to share it with us. Lucy of Carrollton, TX does it again! 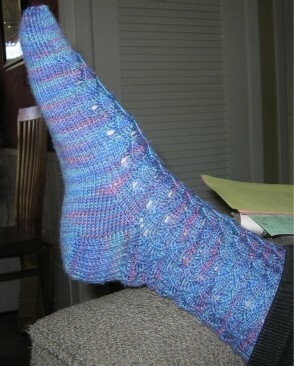 She knit another pair of fabulous socks, this time Gardiner Yarn Works' Slippery Slope in Lorna's Laces Shepherd Sock. This is Lucy's saga..."Yippee! Yahoo! OhMyGoodness - are those finished socks you see????? These socks are perfect for going into fall don't you think? I thought they were so pretty I went and bought the new clogs to show them off with a jean skirt. The pattern was perfectly well written and knitted without a hitch. If you love doing intricate detail work and cables that look like they are much more difficult than they really are this is the pair of socks to knit! The end result is worth the little extra time it took me to finish these. Tell Chrissy I said thank you for another fabulous pattern. There are more photos on my project page on Ravelry." Lucy I'll thank Chrissy for you and once again thank you for letting us see your work. This gorgeous Capelet, crocheted in Karabella's Aurora 8 yarn, is the work of Peggy from Orlando, FL. Peggy shares her story with us..."I just finished my project---Red capelet. The Aurora 8 yarn is a great yarn to work with, and for this project, I used almost 8 skein of them, and the hook size is 4.00mm. The original pattern is from Japanese crochet book. Thanks, I am very happy to do the business with you!" Peggy I'm happy to have done business with you too, thanks again for letting us enjoy your Capelet. This hat is adorable and the model is even cuter, and we have Kim from Columbia, South Carolina to thank for both. Kim knit this adorable hat in Malabrigo Chunky yarn. This is Kim's story..."I bought this Malabrigo Chunky in Tuareg from you back in April. I was looking for a quick project, so I chose "Foliage" from Knitty.com. It was a quick, easy knit (a few hours) and interesting in that it is knit from the crown down. It uses less than one skein of the Malabrigo Chunky and would make a great gift. Thanks for putting the yarn on sale so I could try it!" My pleasure Kim and thank you for sharing your hat with us. 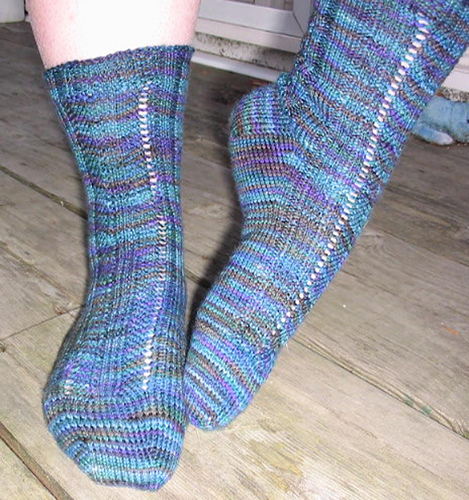 These lovely, lacey anklet socks were knit by Lucy of Carrollton, Texas, the pattern is by Lisa Ellis Designs. But first I must say that Lucy is one fast knitter, it seemed like I emailed her the pattern and a day later she sent me a picture of one finished sock, than this one of the completed pair. This is Lucy's story..."Here are the pictures from the Victorian Lace Pattern. I LOVED knitting these and will definitely knit more of them very soon. The pattern is written perfectly, and is very easy to follow. The socks end up snuggly and stretchy with a perfect fit. The 3 row pattern is challenging enough to make you think but easy enough to knit while watching TV. Thanks again for showing me this pattern. I really do love my new socks!!!" I'm happy to hear that you're happy with them! You should be, your socks look great. Thank you for letting us share them with you. 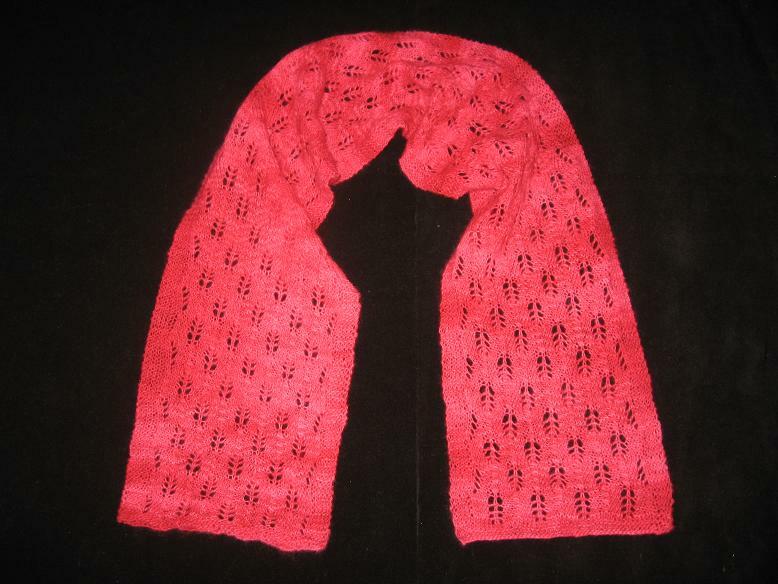 This lovely lace scarf was knit by the very generous Kelly, of Steamwood, IL. Kelly tells us this story..." I knit the Branching Out lace scarf from knitty.com with only one skein of the Malabrigo Silky Merino. The scarf will be a gift for one of my daughter's preschool teachers. The yarn was so beautiful and it was a dream to knit with. The scarf grew about 20% after blocking and is about 50" in length." That is going to be one very lucky teacher and it is very kind of you to gift her with such a beautiful scarf that you worked so hard on. Should someone suffering from "Eyeball Phobia" be knitting with Insubordiknits' Vitreous Humor yarn? Well Rhonda, from Winona Lake, Indiana, was brave enough to give it a try and this fun Eyeball Hat was the result! Here's what Rhonda has to say about her funky hat..."When I first bought the yarn from you, I had NO idea what I was going to do with it. I just knew that I loved it and needed it. This was a bizarre reaction for me since I have what I call and “eyeball phobia”. :-) I looked on Ravelry to see what others had made with this yarn and saw mostly scarves. Not wanting another scarf, I browsed the pattern section looking for patterns that used chunky yarn. That’s where I came across the Chunky Cabled Hat pattern. My hat has since been abducted by my older son and is coveted by many of his friends." I bet his friends covet it and perhaps one or two will be inspired to learn to knit! Great hat Rhonda, thank you again for sharing it with us. Ysolda's plush Elijah is very popular and Rachel's Elijah is the first one I've had the pleasure to see all knit up. Rachel knit this darling little elephant for a very special boy..."I just finished my second elephant and am quite pleased with the result. I had one skein of this odd goldish acrylic yarn that a friend bought for me in Uruguay. Her grandson’s 2nd birthday finally gave me a reason to use it. I think mustardy-gold is a lovely color for an elephant!" We agree its the perfect color, your Elijah has a lot of character, thank you for sharing him with us. 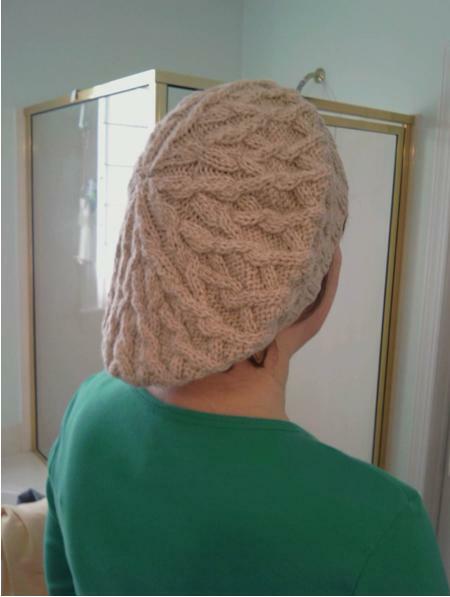 Lee from Charlotte, NC was kind enough to share with us her version of the cabled hat, Ysolda's Gretel. 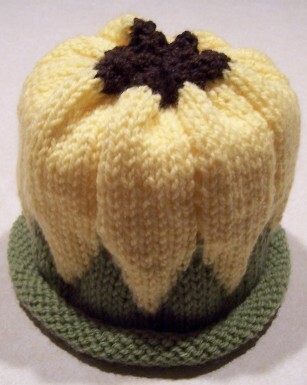 Lee shares about her knitting experience, "...the hat turned out wonderfully. The hat was done in Lana Grosso Lord, I forget the name of the color but it was basically oatmeal." I agree wholeheartedly, your Gretel is wonderful, I appreciate you letting us enjoy it. 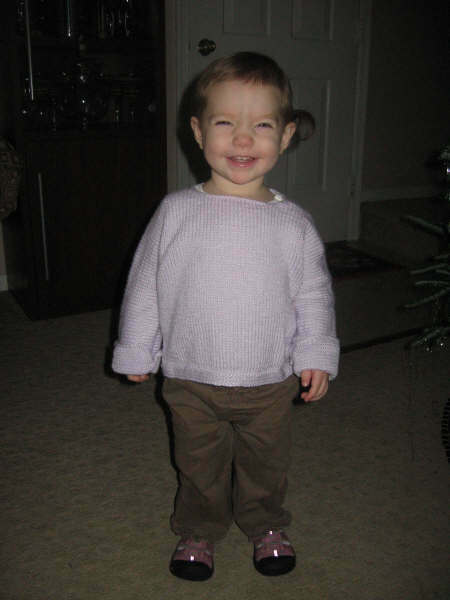 This sweet toddler size sweater, modeled by the adorable Grace, was sent in by Kathleen from New Paltz, NY, this is her story..."I knit the sweater pictured here with Peter Pan Bambino DK that I purchased from your web site probably about a year ago... little Grace FINALLY fits into it! I knit a blanket for this same little recipient with Bambino DK a year prior to this sweater...and I get lots of compliments from her mom about how well the yarn holds up...even with weekly washings!! So I would highly recommend this yarn to any one who is knitting for babies or children!" First your work is delightful and little Grace is precious. And thank you very much for sharing your hard work with us and for your opinion on this yarn. This extraordinary knit top is the work of Suzy, from Memphis, TN, Suzy shares her story..."I already shared this sweater with your group on Ravelry. But I'll send you an attached pic of it too! It's Wendy Bernard's Skinny Empire that I knit on the Malabrigo Silky Merino in Bobby Blue that I bought from you. I love it! (Of course, I see some things I would change- but overall, I'm pretty pleased with it : )" You should be very pleased Suzy, I wouldn't change a thing, enjoy wearing it and thank you very much for sharing it with us! This delightful scarf was knit by Sherry, of Pacific, Missouri. Sherry tells us..."Here is the Just Enough Ruffles scarf made from the Malabrigo Merino Worsted obtained from Sandrasingh.com! Used Addi Turbo #10 needles with a 40 inch cable. I am very pleased with the results." As you should be Sherry, thank you for letting us see your beautiful scarf! Jenny is practically my neighbor, she's up in Temple, TX a stone's throw from me out here in Spicewood. This is Jenny in her gorgeous February Lady Sweater. Jenny told me this..."I bought several skeins of Malabrigo in Tuareg from you a while back, and I used four of them to make this February Lady Sweater. I absolutely love the way it turned out. Wore it last night to choir and got tons of compliments on it. I'm sure I'll be back for more Malabrigo as soon as I can!" I happy to hear your pleased with your work, as you should be, your sweater is beautiful, thank you for letting me share it with everyone and I hope the weather stays cool enough so you can enjoy wearing it. 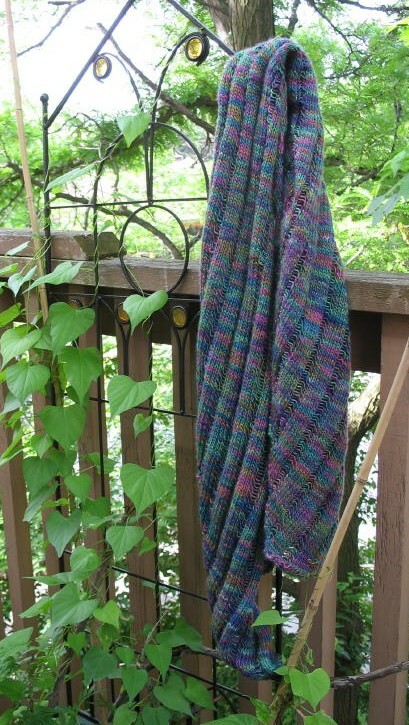 "I *loved* knitting with the La Lana Wools Streakers yarn - it is so soft and bouncy! It's a fast project, too, finished in just over a week even though I had limited time to knit." Thank you Nan for sharing your beautiful shrug with us, I bet you get a lot of complements and requests for repeats every time you wear it. One of my favorite knitters, Darcy from California, emailed me this picture of her lacey, very sweet scarf...Darcy tell us, "I used Malabrigo's Lace Baby Merino in Geranio to knit the Knit and Tonic Easy Flame Scarf." Thank you so much Darcy, your scarf is wonderful and the pattern for this scarf is free on Knit and Tonic's blog. Bob from De Pere, Wisconsin is one speedy knitter, and very talented too. He bought the Kidknits' Sunflower Hat pattern and a few short days later emailed me this picture of his adorable finished project! Here's what Bob told me..."I liked the pattern as it was fun to do and clearly written. I know our eldest granddaughter (2.5 years) will like it and I plan on making another one for our second granddaughter (age 9.5 months)." Bob thank you very much for sharing your precious hat with us, indeed your granddaughter will love wearing it. Agnes from Mt Laurel, NJ is at it again, she loved Gardiner Yarn Works' Bad Hair Day hat so much..."I knitted a total of three Bad Hair Day hats. One according to the pattern (photo I sent to you, see below), a smaller version in the same purple yarn, then one for myself in the alpaca yarn I've had in my stash. I thought I wouldn't have enough of the alpaca - and now I know how much alpaca stretches - so I bought a ball of variegated sock yarn to supplement it." This hat is awesome Agnes, thank you! Lorna's Laces Bee Stripe colorway is only available in their Shepherd Sock line and is a very special colorway indeed, so it is only fitting that the creator of these awesome RPM Socks selected it, as she is very special too! Rachel resides in my home town of Austin, TX and she's the organizer of one of the best Sit N' Knits I attend. This is Rachel's story..."I finished the RPM socks that I made from the Lorna's Laces Bee Stripe yarn that I bought from you. I used two skeins and the pattern is RPM from Knitty." Laura your socks are really cool and I appreciate your sharing them with us. This darling Bad Hair Day Hat, pattern by Gardiner Yarn Works, was knit by Agnes, from Mount Laurel, NJ. Agnes tells us..."I enjoyed knitting this hat. 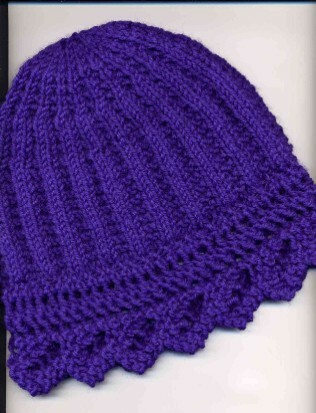 I used a worsted weight yarn." Agnes your hat turned out terrific, I love the color, enjoy wearing it and thank you for letting us share it. Laura from New Jersey thought we might like to see the finished Gardiner Yarn Works' Pinecone Scarf that she made for her daughter using Cherry Tree Hill's Glitter Alpaca in Foxy Lady. 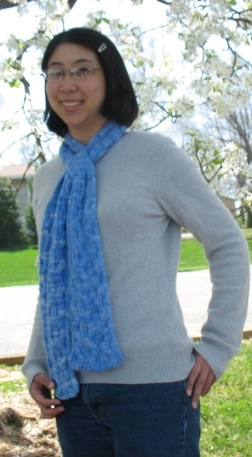 Laura shares her tale..."The scarf is about 54" long and 5" wide knit on #3 needles. I added the knotted fringe at my daughter's request. I enjoyed working with this yarn and look forward to using some of the other wonderful yarns from your site. I am currently contemplating my first-ever pair of socks. Thanks again for your help." Thank you Laura for letting us enjoy your beautiful scarf and we look forward to hearing about your first-ever sock adventures. This amazing Keyhole Scarf is an original design by Huan-Hua and is a variation on another of her originals works, the Water Is Wide Scarf. Here's Huan-Hua's story..."This is the variation with cables on both sides, knit from a skein and a half of Malabrigo Merino Worsted in Jewel Blue. This version was knit with a “keyhole” to secure the scarf." Beautiful design and exquisite work, thank you for sharing with us! It's the season to celebrate socks! And this time were admiring Deanna's Child's First Sock in Shell Pattern, this pattern is by Nancy Bush and can be found in her book Knitting Vintage Socks. Deanna knit this pair with two hanks of Lorna's Laces Shepherd Sock in the Tahoe colorway. Thank you very much for sending in your work Deanna it is beautiful. Robin is an avid sock knitter and a Lorna's Laces Shepherd Sock lover. 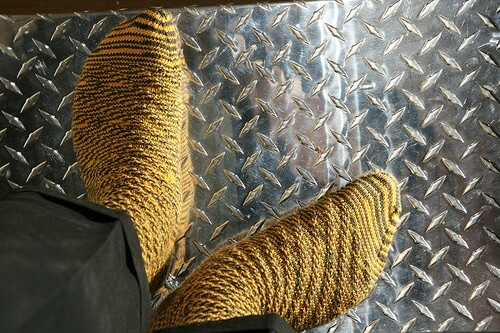 She knit her wonderful socks from 2 skeins of Shepherd Sock..."The yarn’s color pattern Mineshaft was surprising; didn’t know it would be thick stripes – cool! 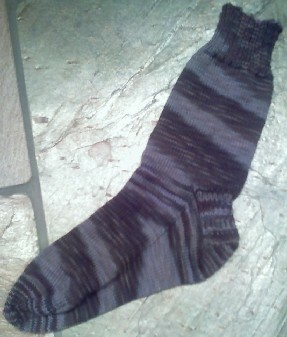 The pattern is from Nenah Galati’s Sock I DVD. The needle size is US #2. I c/o 72 for size large sock. Not difficult, just patience with little tiny stitches!" Very cool, enjoy wearing them Robin and I appreciate your sharing your hard work with us! 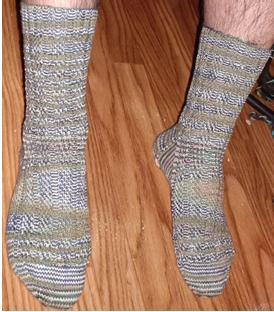 Sally of Austin, TX took the plunge and knitted this pair of socks out of Lorna's Laces Shepherd Sock as a Christmas present for her boyfriend. She shares her story of how she determined her boyfriend was "Sockworthy..."I bought the yarn for these socks last summer when the Austin Meetup group stopped by your house on our yarn crawl. I had been talking with my long-distance boyfriend, Jules, for a few months at that point, and I decided to buy some sock yarn to make him socks. If we made it until Christmas, I would give him the socks, and he would be "sockworthy." Seaside was the perfect colorway, since he loves the ocean. He later told me that Seaside was also the name of a little town in Oregon where he used to hang out with friends. I chose the "Gentleman Socks" for the pattern. While it's a good pattern, it did take three weeks because of the small gauge and twisted stitches. I barely made the socks in two skeins by shortening the leg. (I had bought three just in case, but I was getting inpatient.) Jules likes the socks. In fact, a couple of days ago, it was cold in California, so he put on my socks to keep his feet warm." Sally I appreciate your sharing your wonderful socks with us, your work is excellent and I love your boyfriend story, someday I hope he proves to be "sweaterworthy!" Lynn of Austin, TX is an avid lace knitter and her work is always breathtaking. I've had the pleasure of admiring many of her shawls, and other knit creations, and now she's letting me share these works of art with you. She's knit two shawls from the JaggerSpun's Zephyr Wool Silk 2/18 she purchased at my last Yarn Crawl..."The green one is Peacock Feathers, which is published by Fiddlesticks. I knit it a bit smaller than gauge and it still came out huge. The gray one is Wing-'O-the-Moth, from knitspot.com. 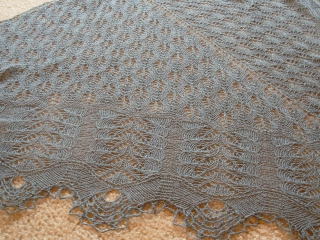 For a full-size lace shawl, it was a very fast and easy knit. I did them both on size 4 US needles." Both are very beautiful Lynn, thank you for letting me publish them. Valorie tells us, "These were knit toe-up, one at a time on two circs (started on 2mm switched to 3mm for instep and cuff), with a simple stitch pattern borrowed from Kirsten Kapur's Ampersand, a free pattern listed on Ravelry. I will definitely order from your site again. The wool is wonderful, prices very good, and the package arrived quickly, even though it had to get through Canada Customs!" First Thank You for sharing your work with us and second Thank You for your kind words about my service. Its always my pleasure to help you. This very sweet Kidknits' Watermelon Pullover & Hat set was knit by Kim, from Columbia, South Carolina. 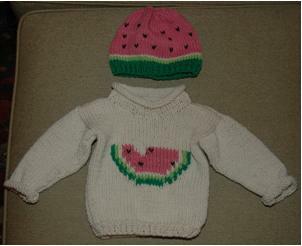 Kim tells us..."I purchased the Kidknits Watermelon pullover and hat pattern from Sandra Singh. The yarn used was Peaches n' Creme 100% unmercerized cotton. I've never made a child's sweater before and it was quite easy! The only changes I made were to omit the loop on the top of the hat and I used a duplicate stitch for the watermelon "seeds" on the hat so as to not have to carry a lot of yarn inside the hat." Thanks for the tips Kim and sharing your work with us. Its hard to believe this was your first child's sweater! This wonderful Capelet, is as stylish as it is functional, and was knit by one of my very talented customers Tacki. 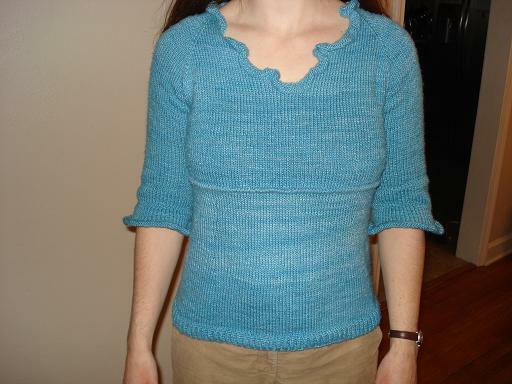 Tacki shares, "Here's a pic of me wearing a capelet I knit with Karabella Aurora 8. I used a pattern called "Spiral Shell" from the book "Wrap Style", Interweave Press. The capelet was knit with 5 mm needles and required 4 balls. The yarn itself is really nice to work with, very velvety, and for patterns with a lot of structure it's probably a very good choice. Not sure how it will turn out after much wearing, but at the moment it still looks good. I have to say though, that the color is not really a light pink, I would rather call it peach or salmon." Thank you Tacki, your Capelet is beautiful and looks great on you! You'll find it hard to believe that this beautiful and soft looking Baby Blanket is the first Kathleen, of New Platz, NY, ever knit! She tells us..."When I found out my college friend was going to have a baby, I decided to take on my first knitted blanket project. I created this baby blanket using Peter Pan Bambino DK in Sugar Plum I purchased on your website. The pattern was called 'elegantly simple baby blanket' from a knitting calendar and it was actually pretty simple once you got a hang of the feathers and fan pattern. I used 6 or 7 balls of yarn on size 8 circular needles for a finished size of approx. 45 inches square. I used some leftover yarn to knit the adorable booties from a pattern in the "Knit Knack Kit". I hope you enjoy the photos!" We love the photos Kathleen and appreciate your sharing them with us. Your blanket & booties are adorable, your stitch work is perfect and you have one lucky friend and new baby! Click on this pic to see Kathleen's Baby Booties. Deb's UGG Booties & Hat and Granddaughter! 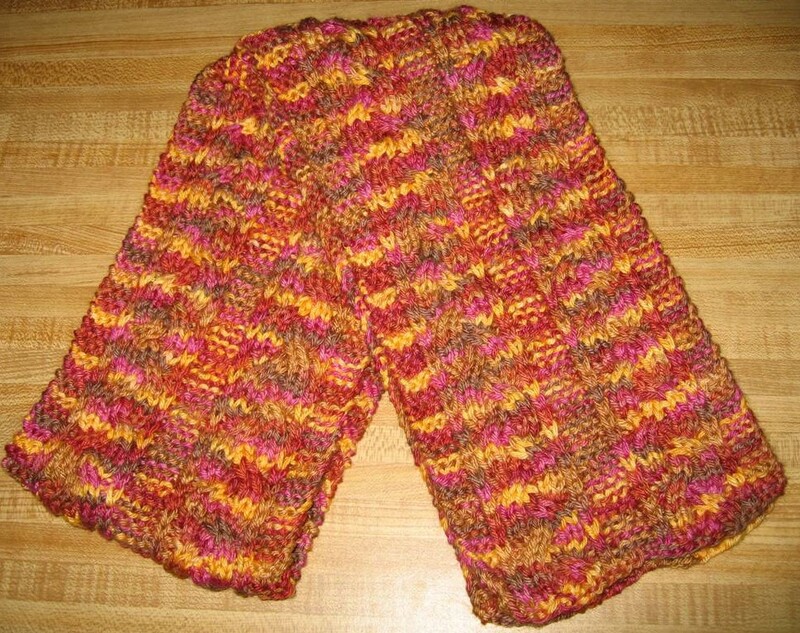 Page below to see a close up this UGG set knit by none other than Debbie of Scotia, CA. But to really enjoy Deb's labor of love take a look at her Granddaughter! "It is her U GG set, complete with the “new” hat I knitted for her, she looks like she’s posing doesn’t she?" She does indeed, what a beautiful smile and she's a real cutie! Thank you very much Deb for letting us share your pride and joy. 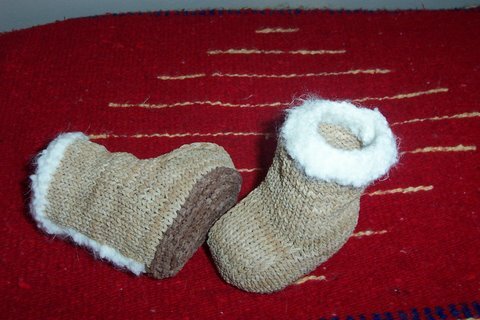 The Berroco UGG Bootie & Hat set is very popular and its easy to understand why! Janet from Danville, IL was kind enough to let us see her version of this beloved set..."I made a slight change to this pattern. Instead of sewing the creamy Berroco plush down the side, I did it down the back. These were so easy to knit up and I can't wait to send them off to my niece for her new little boy." What a lucky little boy! Thanks Janet. 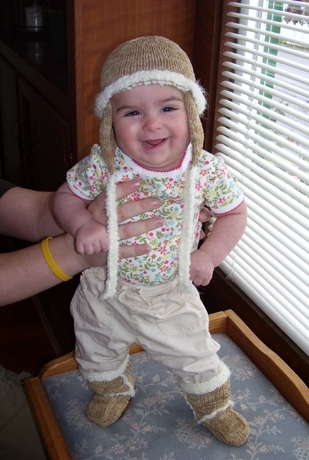 Kathrin of Santa Clara, CA used one skein of Lorna's Lace Shepherd Sock to knit this adorable Baby Hat. 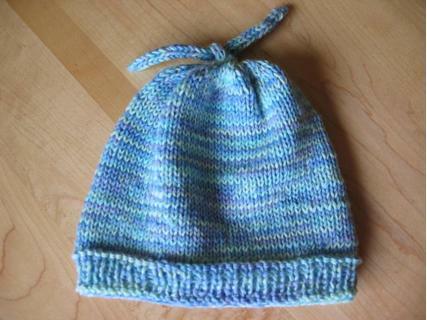 "...one of the Georgetown skeins, I used it to make a baby hat (I doubled the yarn and knitted it on a 3mm needle). I love this yarn. Thanks so much for selling it at such a great price." Thank you Kathrin for letting us see your Hat! Cathryn of Humble, TX finished her version of La Lana Wools' famous Lady Eleanor Stole, knit in La Lana Wools Forever Random Blends, and it is spectacular! "I finally finished the Lady Eleanor Stole and it is on it's way to my daughter in England for Christmas. I've attached a couple of pics. I am very pleased with the way it turned out. I grew up knitting in NW Iowa. The only yarn choices at the time were from the "dime" store. (So...Red Heart, mostly!) Now living in the Houston area I am re-discovering knitting with awesome yarns. I can't wait to visit your showroom next time I'm in Austin!!" Cathryn your "Lady E" is lovely, thanks for letting me post a picture. Deborah, of Fort Myers, Florida, was kind enough to share her very sweet baby socks. We love the scalloped edges. "I purchased the Lorna's Laces Shepherd Sock Yarn in Grapevine from you recently. I knitted a pair of "Better-Than-Booties Baby Socks" with the yarn. The pattern was published in Interweave Knits Summer 2005, but is also available free on their website. They were real easy to knit and I loved the yarn (I'm looking to get some more). I am giving them as a shower gift next week." I'm sure they will be cherished. A Big Thank You to Vicki, who is from Salida, Colorado, she created this beautiful pullover in Cherry Tree Hill's Potluck Worsted. This is what she has to say..."Here is my finished potluck jewel sweater. The basic construction comes out of the techniques in Jacqueline Fee's "Sweater Workshop". It's knit on size 6 and 8 needles to a 40 inch bust size. The stitch pattern is a slip-stitch design over 10 stitches and 6 rows. The slipped stitches are cabled on the third row with a cable 3 right and left. The stitch is a combination of things I found in a couple of stitch pattern books. I call this my "stained glass" sweater, for rather obvious reasons. I didn't do any planning for the way the coloring worked out other than to start with the most deeply dyed skein first and put them in order of darker to lighter hues. I used 4 1/2 of the 6 skeins. It took some experimenting to come up with a stitch pattern that breaks up the striped effect somewhat, and the sweater is blocked very lightly to preserve the texture. I tried out a basically stockinette stitch for the yoke with some seed stitches and a couple of rows of reverse stockinette, but I found this made the yoke just look very plain and uninteresting next to the richness of the body and sleeves. I was concerned about continuing the slip-stitch pattern through the yoke while doing the raglan decreases and then just decided to "let the chips fall where they may." It worked out fine, especially using the "feathered" look in the raglan "seams." Fortunately, this yarn doesn't suffer from being ripped and reknitted. This is gorgeous stuff, and I think this sweater is going to be a favorite." 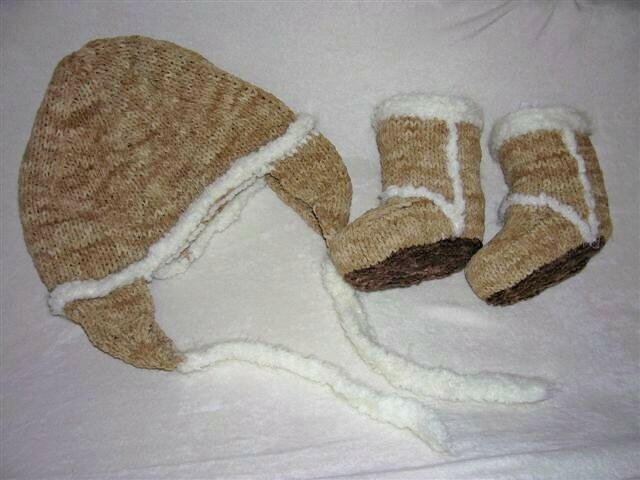 There is going to be one snuggly warm baby this winter who will look adorable in this UGG Baby Booties & Flap Ear Hat Set! They were knit in Berroco Suede and trimmed in Plush by the talented Debbie of Scotia, California, she tells us "...here’s the picture of the set, I did not add a “bill” to the front, as I preferred it without it." We hear a rumor Debbie is going to knit a matching little cardigan and can't wait to see it! This beautiful TuTu dress was created by Ida of Philadelphia, Pennsylvania. 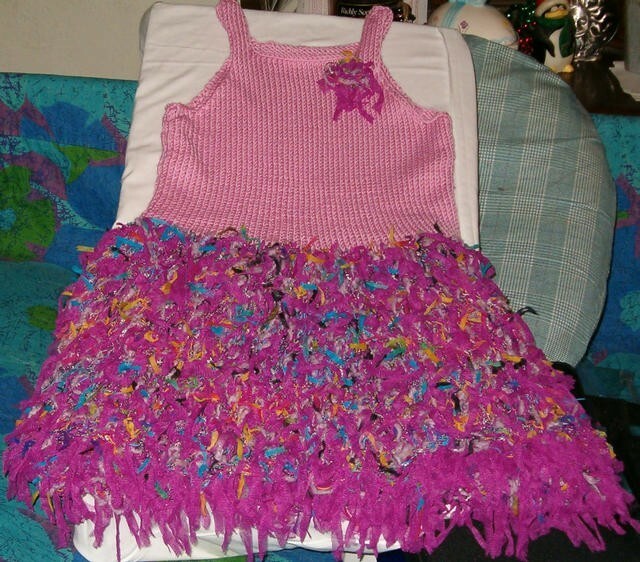 "...Princess Dress as I call it - it is a free pattern from the Berroco site called Coppelia. I've made 2 of these dresses; the little girls just love them, but as you can imagine, the tutu can be a bit expensive. 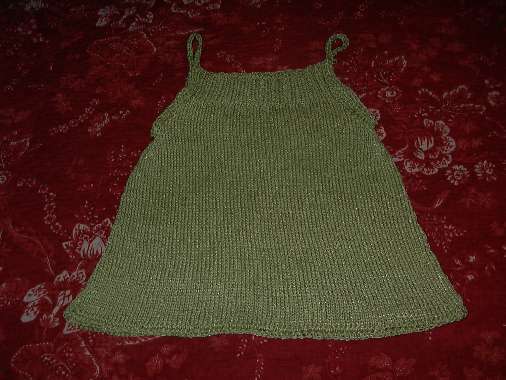 I used Debbie Bliss Baby Cashmerino for the top, as that is what I had on hand." Thank you for letting us share this beautiful dress! 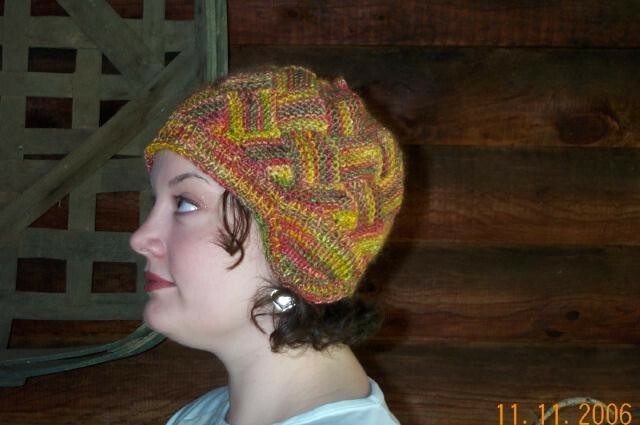 This beautiful Entrelac Hat was knit by Lynne from Kingsport, Tennessee. "These are pictures of my daughter modeling the cap I made from your kit. I am really pleased with it." You should be Lynne its spectacular! The kit is from Dancing Leaf Farm and we appreciate Lynne allowing us to show off her fine handiwork. One lucky little baby will soon be wearing this adorable Layette set crocheted by loving Grandma Careen Henry of Tempe, Arizona. 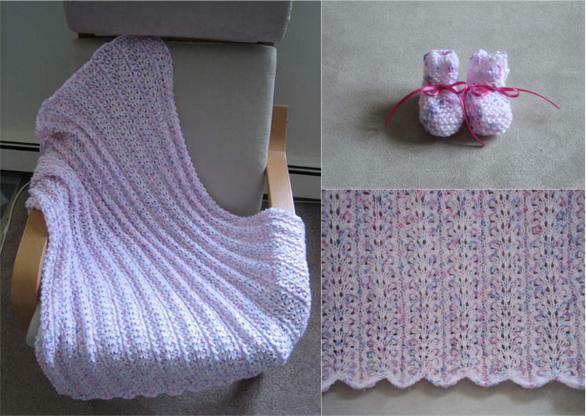 Careen shares..."This is a baby layette I crocheted for my expectant daughter's first baby. It was a recent gift at her baby shower. I used Wendy/Peter Pan Bambino yarn in Hint of Lemon, purchased from your website. The sacque and bonnet pattern came from a Leisure Arts Little Books design by Carole Prior. The booties were from Annie's Attic "Precious Baby Booties" designs and the Heirloom Blanket was a Jane Davis design from the book "Simple Crochet for Cherished Babies". The blanket features an edging with silk ribbon. 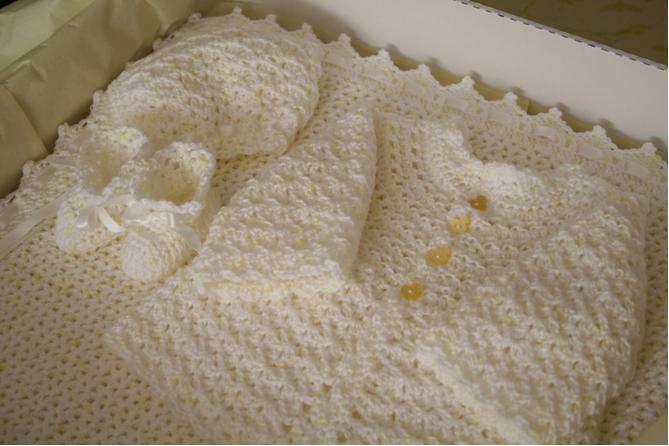 This was my first baby layette, made with love from Grandma." Careen is clearly accomplished in the art of crochet and its hard to believe this is her first set. Thank you for letting us publish your work! Andrea Merrit, a busy teacher from California, was kind enough to take a moment to share her beautiful Cabled Scarf with us. She stitched these beautiful cables in The Schaefer Yarn Company's 50% silk & 50% wool yarn Marjaana in the colorway Louisa May Alcott. I bet Andrea is going to miss Marjaana as much as we are! Thank you very much Andrea for letting us publish your scarf, we would love to see more of your work! Susan from Canada has her own knitting blog, www.knitnut.net She knit her Clapotis in Cherry Tree Hill's Silk & Merino Worsted in the Peacock colorway. Here's her story! "...I love my clapotis. And now that it’s finished, all my co-workers can see for themselves that there’s nothing poncho-like about it. Did I ever tell you why I hate ponchos? When I was in grade 7 I went on a charity walkathon with my boyfriend, Danny Manship. I think it was 27 miles. My mom thought it would be cute to dress me like a Mexican, and it would also be a good way to get some use out of all the mexican tourist crap she bought in Mexico. So I had to wear a sombrero and a heavy wool poncho, and - get this - I had to take a goat on a leash. A real goat. Danny was a highly competitive guy, and he was convinced that a walkathon was really a race and whoever finished first was the winner. So he wanted us to RUN 27 miles and win the race. I pretty much RAN 27 miles in a sombrero and a poncho with a goat on a leash. God what a miserable day that was. The sombrero kept blowing off and the poncho was really hot. Here’s a little known fact: goats aren’t fond of running. As for the clapotis, which is clearly not a poncho - it took awhile, but I think it was worth it. 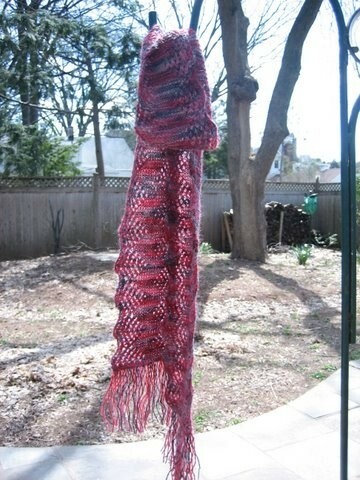 This is my completed clapotis (say that three times fast). I knit it using 2 and a quarter skeins of Cherry Tree Hill Silk & Merino worsted yarn in the peacock colorway. This picture shows the size best - it’s big - about 5 feet long. I made it exactly according to the pattern. If I were to make another one, I’d make it wider so it would be longer (more shawl-like) in the back." We appreciate you letting us share your Clapotis and your goat story on our site. Keep on blogging Susan! Take one look at this bright, colorful purse and you'll understand why Loretta of Louisiana calls it her Happy Purse! The pattern is loosely based on one that Loretta found in a Knit N Style magazine, she changed the yarn to Schaefer's Kathleen in Bette Davis and knit it up quickly in short rows on size 10 circular needles, then felted. The rhinestone button and feather embellishments are the perfect touch. Loretta hopes you enjoy looking at it as much she did knitting it! Your Happy Purse is beautiful Loretta and we appreciate you sharing it with us. 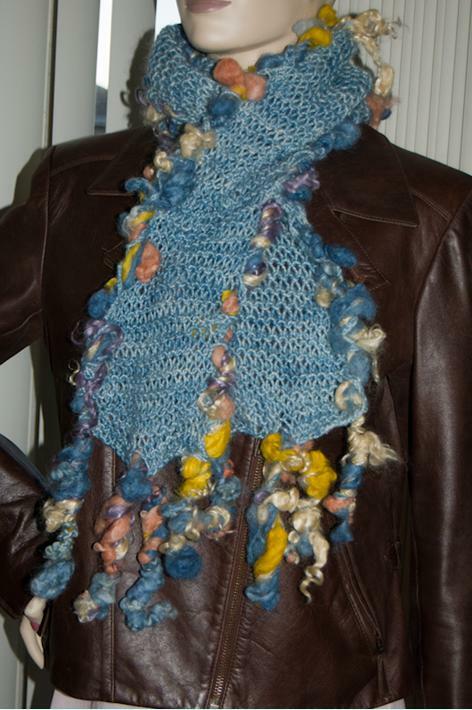 This is LaLana Wool’s “Stone Soup Scarf” knit by Amy Crupa from Lisle, IL. She tells us she fell in love with the picture of it on our website, had to have it and found it very easy to knit! It is a simple garter stitch done in their "Dos Mujeres" yarn and accented with "Thickspun Jewels." “It’s now my favorite winter scarf and I definatly need it this winter!” Thanks Amy! 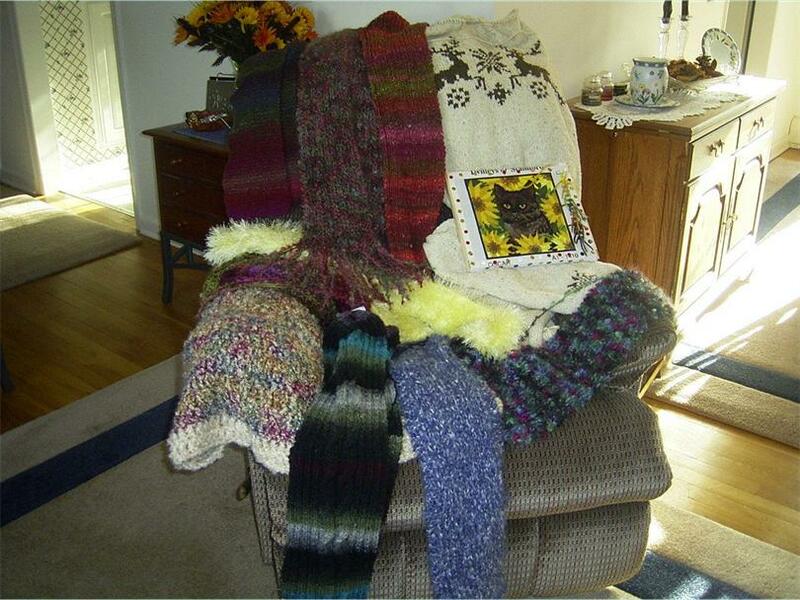 One of our favorite customers, Susanne Banas, sent us this pic--a collection of her hand knit holiday gifts. Susanne is an avid knitter and also accomplished at needlepoint (notice the cat in this picture) and sewing. She has been knitting for many years, learned from her mom as a young girl, and has passed this love for the art down to her daughter. She includes local yarn shops as points of interest during her travels to new cities! This is what she has to tell us….”Here are some silly pictures - mostly of easy things that are quick to make for "holiday" gifts. During the rest of the year I tend to do more challenging projects. There is a sweater with deer on the front (for my husband), several scarves in Noro, Cherry Tree Hill Fun Fur and Froth and Lion Brand's new cashmere blend for my father who wanted something soft. Thank you very much Susanne we look forward to seeing more of your work. This beautiful scarf in Cherry Tree Hill's Sachet Ribbon is a one-of-a-kind! Knit by one of our best customers, Dorothy…”I just used the ribbon until it was gone!” She added fringe not only on the ends but made the scarf more interesting by fringing it across the length. Dorothy loves to knit and this hobby helps her pass the time she spends waiting in airports, this is where she finds herself quite often due to the travel she does for work! She takes her beloved hobby one step further, she donates her scarves to the local Salvation Army. Dorothy is a fabulous knitter with a big heart. Thanks for sending us your creation. Next, congratulations go out to Lara Foster of Paradise, CA for her Arlene Trapeze Tank. Before we discuss her beautiful handiwork we have to let you know that Lara is multi-talented! Besides being an accomplished knitter she also writes her own knitting blog, Knitting In Paradise. We highly recommend reading her witty anecdotes and insights into the world of knitting! See for yourself, Knitting In Paradise, you’re sure to enjoy it. Thank you very much Lara! This pattern is originally from Berroco and was designed for their cotton and rayon blend yarn Cotton Twist, we offer it free in our Patterns section. These colorful Hats & Scarves, and the very warm and snuggly looking Afghan, were created by our customer Carolyn. Carolyn crochets for others in need, she has donated over 18 pounds of crocheted clothing and blankets to the Bloomington, IL chapter of Warming Families. Carolyn asks, if you have the time, to visit Lion Brand’s website and browse the 'Find a Charity' feature. As the cold-weather season approaches, this is a great time to contact a group and find out how you can help before the "season of need" sets in." Thank you Carolyn for sharing not only your creative handiwork, but your generous spirit as well.